I think I might have crossed some kind of invisible line with you last time. As always when I post a recipe there is the slightly anxious wait until the first ‘like’ button is pushed, or the first comment is made. Once that happens I tend to switch off the computer and get on with cooking dinner, or herding hens away from tender edibles, or both simultaneously. Which is hilarious, I tell you. This time, with the mackerel and rhubarb recipe, my wait was longer, and indeed sweatier (that was ‘sweater’, but I just discovered a dropped ‘i’). As I chopped veg, Maccabees blasting through the speakers, I found myself sidling over to the lonely computer, looking for the little plus sign on the dashboard that lets me know someone has at least read the title and thought, ‘Hmm, that’s alright, I’ll click the like button. Put her out of her misery.’ I don’t know how long I waited, but I think we were actually eating dinner before one of you kind souls triggered the all-important plus sign. Thank you. You saved a grown woman from getting another frown line. So enough with the weird stuff for right now. Let us have cake. 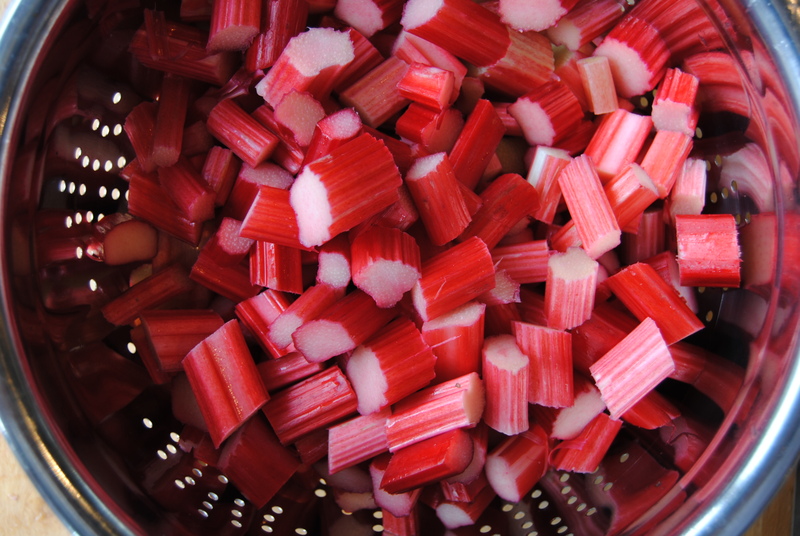 Still with rhubarb – because it’s seasonal and scrummy – but with sugar, cardamom, flour and all those other nice things. And it will make your house smell amazing. Unlike mackerel. So, to the Friendship Cake, a Herman the German Friendship Cake – which I notice is always capitalised, so I shan’t break with this tradition. Most of you will have heard of This Cake even if you don’t know quite what it is, been given the ‘starter’ or even tasted a wedge. I must confess I had not heard of it until I was listening to my favourite morning radio programme, BBC Radio 4’s “Woman’s Hour.” Sometime in April, as I was tootling up to Fife for a cancer nutrition workshop, boot heaving with vegan whatnots for our lunch, I caught the segment about Herman Friendship Cake. Jenni Murray’s trailer tidbit caught my attention: “Is the friendship cake a comfort or a curse?” A cake as curse: How was I not going to stick around for a discussion like that? I found from Sharmini Selvarajah’s Woman’s Hour segment that This Cake is a sweet version of a traditional sourdough bread starter. And it does indeed attract quite strong views. Not for its taste -which is uncontroversially lovely, but for the sharing bit. I’m truncating the whole story here but basically you make a mother, or starter, tend to its every need for nine days, then you make the cake with a one-quarter portion, while simultaneously racking your brain to see who might take the other three shares. Then you do it all again, ad infinitum. Some careworn-sounding interviewees said they would have run a mile had they known that the woman bearing down on them with a takeaway carton was in fact offering them yet one more living thing to feed and keep alive. A seething, slightly whiffy batter baby from which to beget cakes for years to come. But later, looking on the Internet, I saw that This Cake attracts much more admiration than opprobrium. Trawling around I saw a great looking gluten-free, egg-free, dairy-free (!) Herman Friendship Cake from the very funny Pig in the Kitchen, as well as enough variations to make me think that I would bravely take the requisite takeaway carton of goo should it be offered/thrust. My Herman starter came with two pages of strict instructions, the most startling of which was “You CANNOT put me in the fridge or I will die. If I stop bubbling, I am dead.” The caps and boldface type is Herman’s, not mine, btw. My hyper-active and freewheeling brain baulks at strict instructions but I do like a challenge. So I decided Herman could stay, if only for Miss R’s sake. She has no siblings you see. And so, conveniently forgetting the Massacre of 2009, when I accidentally-on-purpose killed my sourdough bread starter, I have now been keeping The Starter on the go for over six weeks. From it I have made a number of different cakes for self, friends and workshops. They have all been incredibly delicious, and now that I have had It awhile I have become more bold in my experimentation. This recipe is probably my least outré version and none the worse for its simplicity. I am somewhat lucky I suppose in that I have not yet needed to give a portion away, but that time is fast approaching. Have you had a Herman starter? What was your reaction to receiving it? If you have/had one, what did you make with it? Have you had trouble giving your starter away? What is your best, most fool-proof tactic for giving it away? So many questions… Please let me/us know your Herman Experiences. I love Herman! Miss R’s (Second)Track of the Week: ‘Went Away’ by the Maccabees (live version from Later with Jools Holland). Miss R has been blasting this peppy tune to keep motivated as she prepares for her last exam (Spanish). It is somewhat debatable whether giving away starter for this cake is a mark of friendship or desperation. But there is no denying that the resulting cake, baked from a carefully nurtured ‘mother’ mix, is moist, light and incredibly tasty. It is also a cake not done much in the UK; we tend to go for sponge cakes and whisked cakes rather than a bung it all in a bowl type cake, as this is. There are many variations around – see Mumsnet for ideas. This is my seasonal spin, with complementary cardamom. 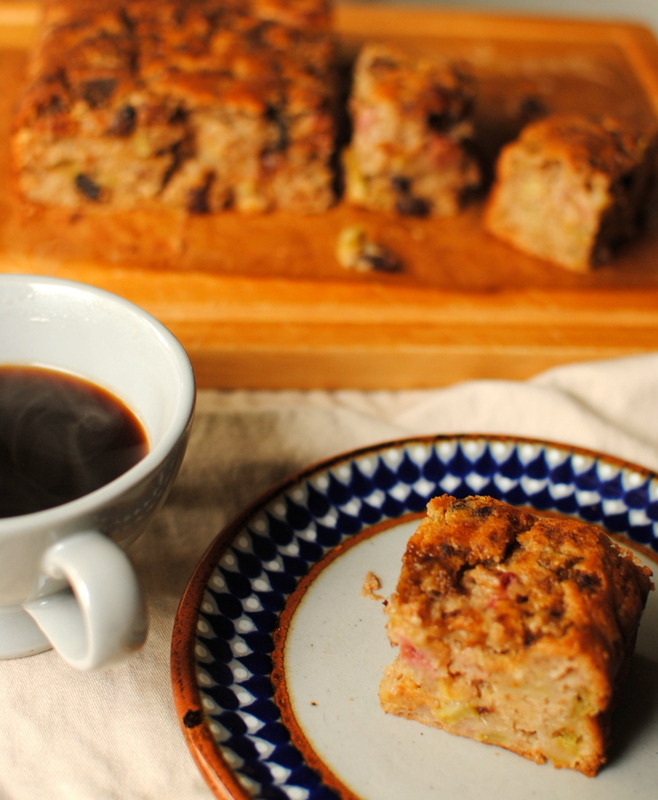 And here is a link to the original (-ish) Herman the German Friendship cake recipe that’s had UK cake bakers in a tizzy ever since. You will need to look at it for the starter recipe and its keeping instructions. I know the above pre-recipe chat was a bit jokey but this is really a great starter and recipe, so do give it a go. I just hope you have lots of friends! 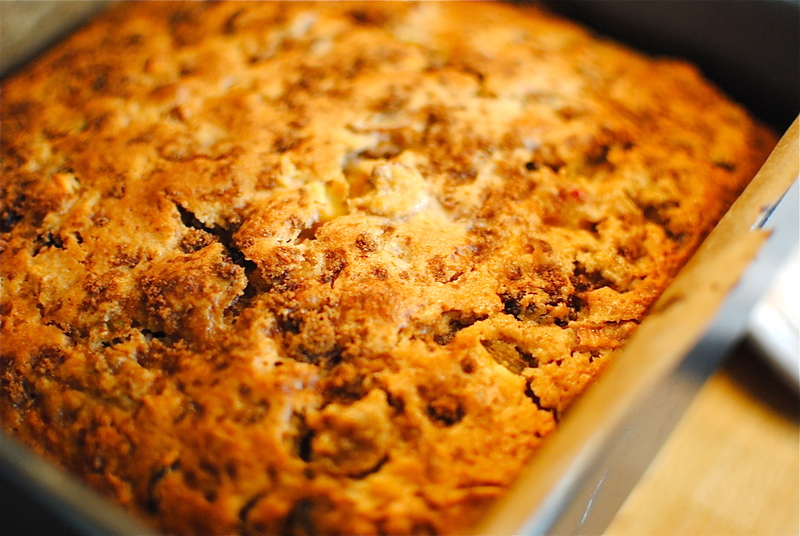 Here is my adapted version of the Herman the German Friendship Cake. It is supposed to have a melted butter and brown sugar topping, but we like it without this extra step. To be honest, the keeping quality is better without the topping. Starter and original cake recipe is on the above link. I bet this would be great with a ‘plain’ sourdough starter if you already have one of those bubbling away somewhere warm. Mix the dry and wet (including the starter) ingredients separately. 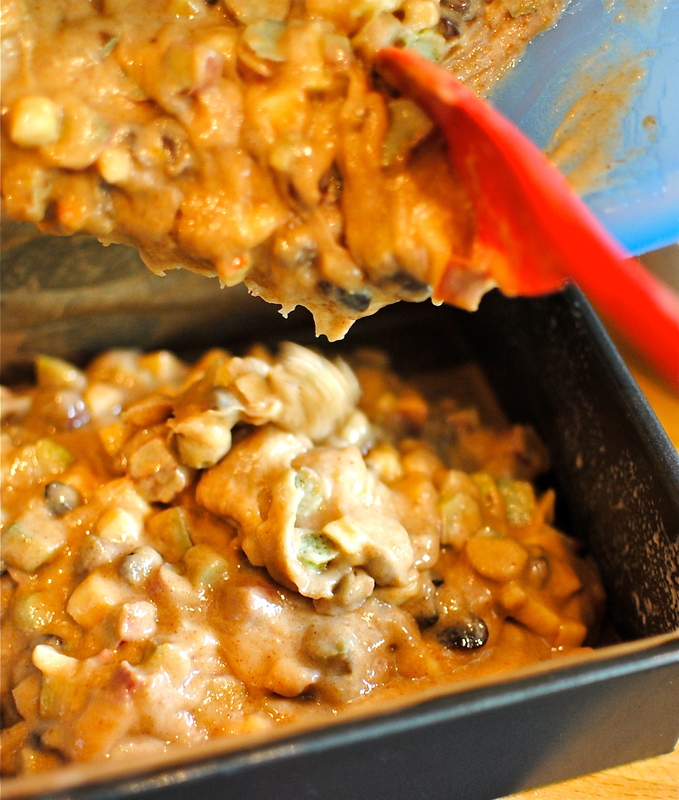 With a large wooden spoon or sturdy spatula fold the dry mix into the wet, add the apple, rhubarb and raisins (if using), then pour it all into a steep-sided, buttered and lined square cake tin. Gently even the top with a wet spoon and sprinkle over brown sugar, if using. Bake at 180C/350F for 45 minutes, then cover loosely with foil and continue baking at 170C for a further 20 minutes or so. Some of you might have a done cake at 45 minutes but I never have, and neither do any of the others I have read about. 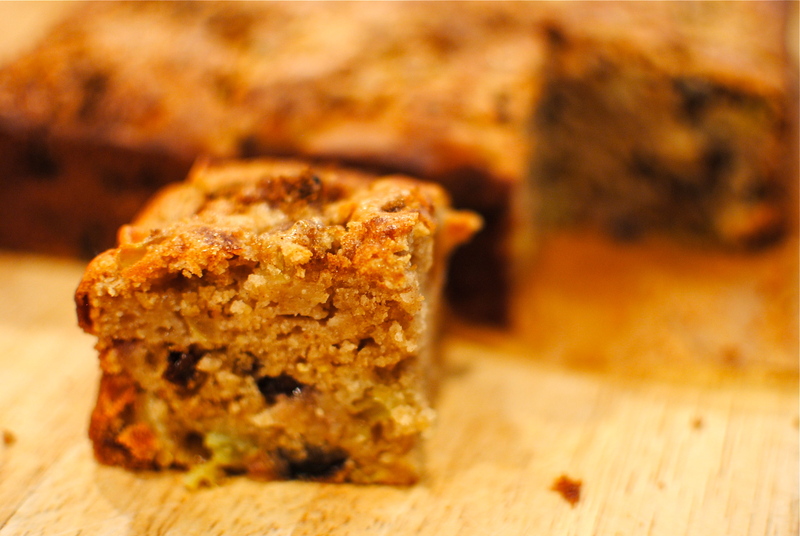 Your Herman Cake is done when a poked in skewer comes out clean. Let the cake cool in the tin then cut into 16 pieces. Herman freezes well and is nice on his own or warmed and served with all the other usual cakey companions. Coffee is a must. 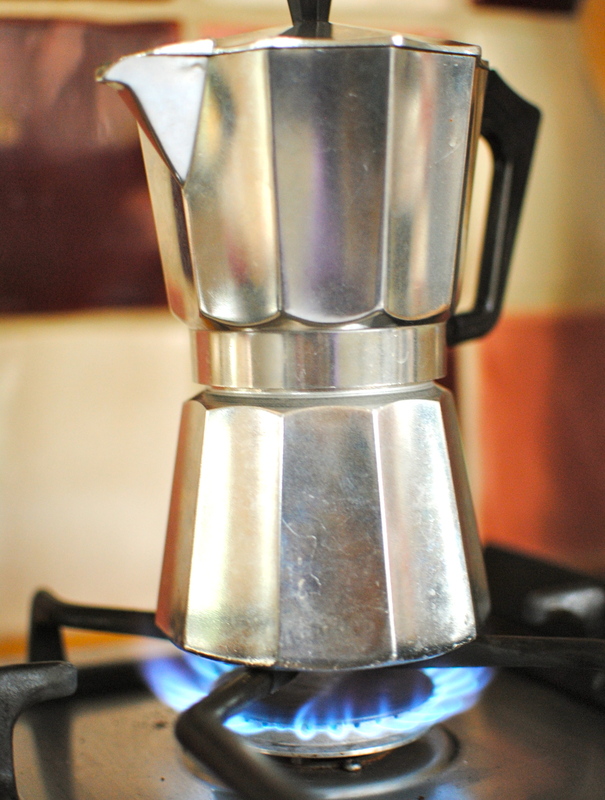 Anything cardamom grabs me, but the sight of coffee brewing on the stove as well puts me in a swoon. As a matter of fact, the mackerel recipe really resonated with me, too (I live in Taiwan where, happily, I can grab a bit of grilled mackerel just about anytime I want.) 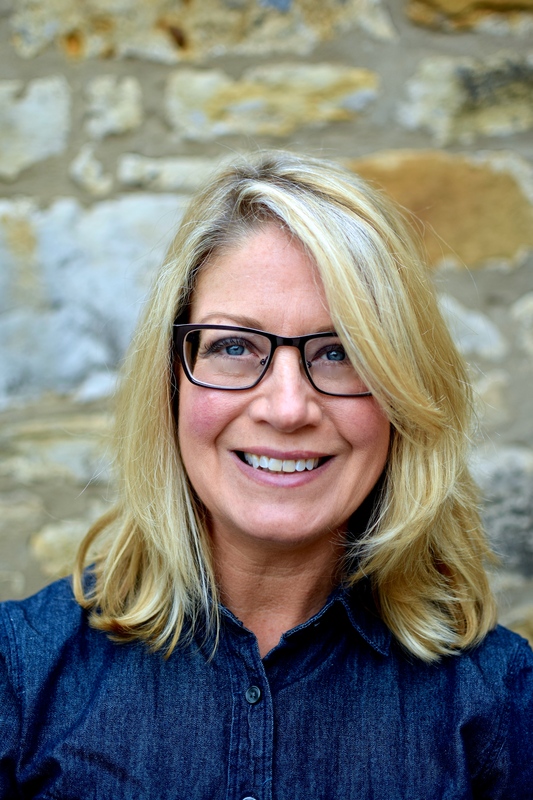 This is, in fact, the first time I have ever digitally confirmed my liking one of your posts, but honestly, yours is the ONLY blog I read regularly, and I’m so fond of your recipes, writing style, and good taste that even my boyfriend knows a few things about you (or, er… your digital persona). Keep the savvy sass and culinary contributions coming — you are liked! I have never received one but my lovely mother did–and she got rid of a bunch of it using her children (aka me and my brother). She used to send me and my younger brother with gifts of it for my teachers. Granted, as an adult who really loves starters of all stripes, I would be tickled to get something like this from a student. But, based on the looks I got from some teachers they didn’t seem too pleased. Some were just confused. None of this stopped my mom though–she was dedicated. I am so glad you posted this–I had forgotten all about lugging jars with notes to elementary school! 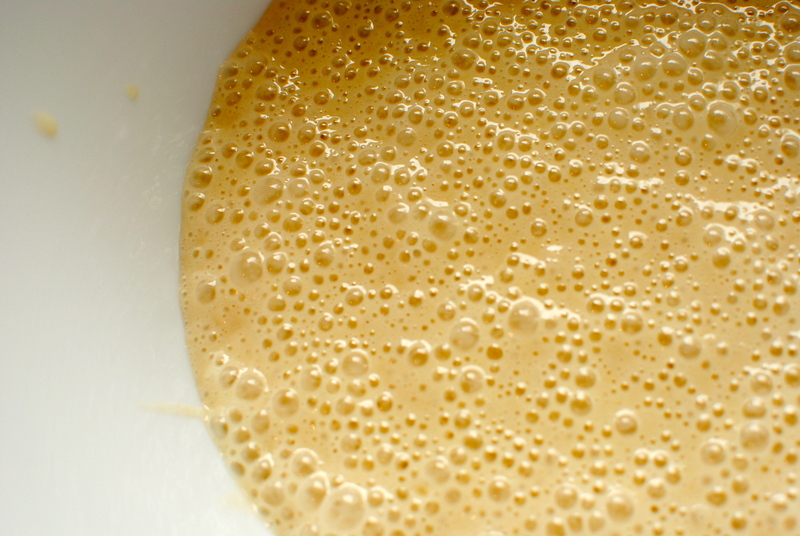 This post also makes me want a sourdough starter again! Aw cheers for that. End of school is looming for some kids so this might be just the kind of thing to revive as a teacher’s gift. Although today’s teachers are probably too busy to want to cosset and nurture yet more living things. Like you I would be pleased to get a smelly pot of starter. But maybe we are just weird 😀 Like I said in the post, I think a ‘plain’ starter would do the trick just as well so you could do a two-for-one thing with a neutral starter. oh rhubarb- i still havent eaten any this year. its about time to pick up some fresh stalks and make a yummy dish! I love this post also because of the italian mocca machine you are using. It makes the best coffee ever. an italian man recently told me that the most traditional way is to use losely ground cofee beans (bigger pieces) and put the little mocca machine on very low heat on the stove. the perfect ones takes about 10 minutes to make! i used to have a little one and took it with me everywhere i travelled. i miss it! Ours goes on holiday with me! I do the slow method too as it eliminates any chance of a burned taste. I have three sizes – a teeny one that could fit in your pocket, the one you see and a massive one you could get palpitations from just looking at. And, get some rhubarb in! I was just reading about the Herman starter in a newspaper article. Fascinated me, as I have my own sourdough starter which I care for and love. It wasn’t given to me by a friend, I started it myself, smuggled it across borders when I went home to Singapore, and then smuggled it back, got caught once, and had to restart one,it’s been an adventure for sure! I’ve shared my starter with one keen baking friend, but that’s it. It’s a lovely idea, this whole spreading the friendship by sharing soemthing as simple as a starter, and I love how people are bonded by food. The cake looks brilliant, I love cardamom and rhubarb, though haven’t tried the two together as yet. It’s funny that some of the woman’s hour folk were so freaked out by getting a starter. Like you I think it is a bonding, friendship-nurturing thing, this whole starter business. I am impressed you kept yours going for so long, although you must have been gutted when Customs snaffled it (I bet they used it though). I may get a bread sourdough started now that the weather is marginally warmer. It is a bit trickier for us Scots to keep a starter going but I was still a bad mother of my mother, so to speak. Thanks so much for commenting and sharing your experience. What a great cake for our street party weekend. Was contemplating some rhubarb this morning and now I know what I will do with it, along with a little ‘starter’ friendship present for all the neighbours. Not much of a crop of rhubarb this year though – think it drowned in April rain. Hope the’ itis’ is subsiding and you are back to singing along with your great music links. This site fulfils my two loves in life – food and music! I am fearful of sourdough starter maintenance as well! With one more commitment my poor houseplants will revolt! But one day I may give in to the allure of a pet in my kitchen! This one is a good one to start with as it just needs stirring every day and on the 4th and 9th you feed it. It doesn’t seem as pernickety as a traditional starter, I guess because of the sugars content. We have Herman sitting in a massive bowl (it needs a massive bowl to grow in) covered with a teatowel. We forget he’s there most of the time! I get Miss R to tend to him, so I’m cheating a bit. Cardamom and cake! What can go wrong? I know! You and I are both cardamom fiends so any excuse for it and I take it. Do you know about Herman, or is he a crazy western thing? OH BOY yes. It’s such a pain. When my kids were younger and I hung out with a lot more “moms” (i.e. swim team moms, lacrosse moms, football moms) the starter used to go around like a virus. Every once in a while I miss the cake but not enough to go search for a starter and being that I’m from a third world country can never throw anything away… I love what you’ve done with it though….Herman has finally become cool! Oh Kellie, this looks and sounds delicious, I can almost taste it! Yummmmm. Oh my gosh I love the beginning of your post because it is so honest and I think it resonates with most bloggers if not all of them! It is just so gratifying to know someone likes you (er, the post). I brought home a friendship bread that sounds like the Herman when I was in high school. Well really my friends and I all carried it around in school to make sure we were taking care of it (kneading it and such). I remember it being good although I have to say the additions you have made look much better. So I’m not the only one who eagerly awaits the first comment or like on a post?? 🙂 From my experience, sweet recipes will probably win out over fish recipes any time 🙂 Love this cake, and I have pinned the gluten-free version to make. I do recall, from my gluten eating days, what a delicious and moist cake this is. So glad you shared! 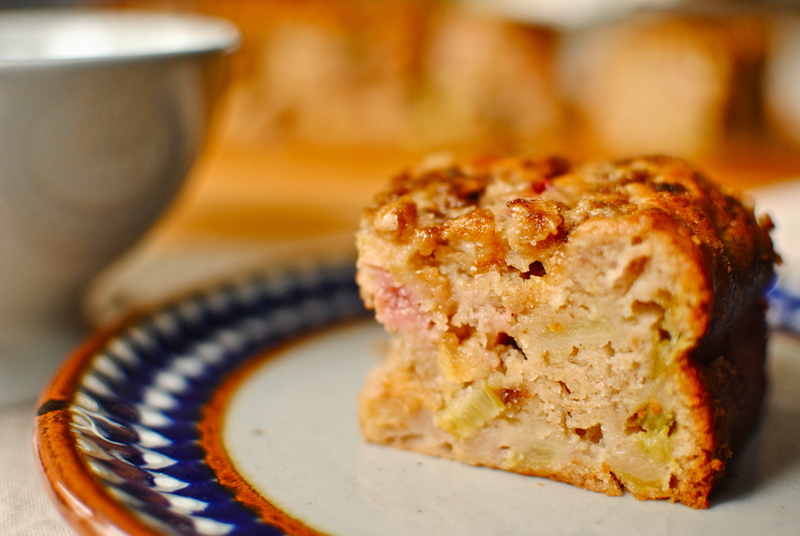 mmm… rhubarb and cardamom sound like a winning combo – hadn’t thought of that! The Rude Health cereals arrive at my house – we’ve gobbled most of them up already – so good! Thanks for the giveaway again! I feel like I’m always learning something new when I visit! I’ve never heard of Friendship cake but it’s going on my “to-make” list. Love that it uses a sourdough starter. And rhubarb and cardamom together? Absolutely brilliant.